On the Internet you can read many things about the Huayna Picchu Mountain and without doubt what you will see, is that you have to book your tickets in advance, and that is that so many people are looking for one of the 400 tickets available, than to book a Of them, you will need to check availability 4 months earlier, otherwise you may not be able to get one of these tickets. It is true that the walk through the Huayna Picchu is quite difficult, but the sensation that you will get after reaching the top can change your life completely. Also how many times can you see the Inca City of Machu Picchu from above. Huayna Picchu is the main mountain of the Sanctuary of Machu Picchu and icon of the place, it is the mountain that can be seen in all the postal photos of Machu Picchu, just behind the Inca city of Machu Picchu. For some people it is the most beautiful mountain in the world, for others, the most terrifying; However, we are sure that all people would like to see Machu Picchu from the top of the Huayna Picchu Mountain; But we also know that not all can, especially if you can not control your fear of heights. 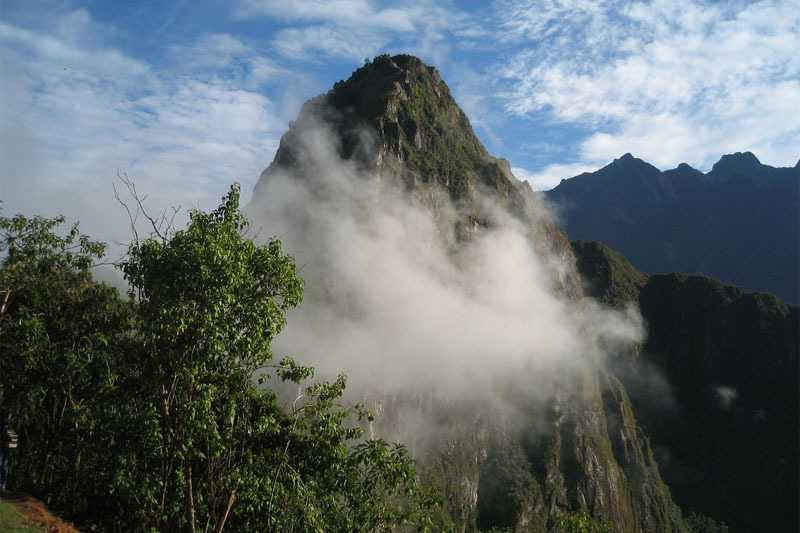 Why visit the Huayna Picchu Mountain? It has to know the mountain Huayna Picchu, its paths are visually terrifying because they are built between the walls of the mountain and enormous cliffs on the river Urubamba; Yes, Machu Picchu is one of those experiences that can not be missed in life, and Huayna Picchu is one of the must-see places in Machu Picchu. The aerial views you will get from Machu Picchu from the summit of the Huayna Picchu Mountain is so impressive, you will feel it is reward enough for the effort made. The stairs of death are one of the most terrifying stairs in the world; Although his name may be dissuasive, do not worry, no one has died on these stairs. At the top there are still places to explore, amazing Incan constructions, extreme terrain and a path that descends to the Temple of the Moon, seated in a natural cave. Huayna Picchu will give you the opportunity to have an intimate encounter with nature and the energy that gives off the earth throughout the tour. The base of the Huayna Picchu is located more than 2,500 meters and rises 300 meters above Machu Picchu. This altitude causes the air to have less oxygen, which will produce a feeling of intoxication when breathing the pure mountain air, this added to the physical effort involved in the climb. It will give you a unique and unforgettable experience. The flora and fauna of the place are simply wonderful, with endemic species, so you will not be able to see anywhere else in the world. If you like adventure, buy your ticket Machu Picchu + Huayna Picchu as soon as possible. It is an unusual experience, especially for nature lovers hiking and risk by trail paths, in a place where you can connect with nature in a unique way, you can be charged of the fabulous vibe you feel in the place. The level of difficulty it presents can be mixed with the time it takes to climb, which will become a very interesting challenge. You will not need much walking time to begin to appreciate the beauty of the tropical forest that surrounds this area, after some route, the road becomes sinuous, with stone walls, which will have to climb, in some cases helped by ropes and stairs. We assure you that if you do not have your own reasons for ascending to Huayna Picchu, you will find them . And it is that if you did not know, the trek from the Inca City of Machu Picchu to the top of the mountain Huayna Picchu, is one of the most amazing short walks on the planet. People from all over the world are booking Huayna Picchu tickets well in advance. Book yours. How to get tickets for Huayna Picchu Mountain? It is very simple to get the tickets Machu Picchu + Huayna Picchu through us, it is recommended to reserve them with 6 months in advance, otherwise you may not be able to choose exactly the dates you want to enter, since only 400 people can enter every day. The mountain Huayna Picchu will take your breath, literally. Which is the best group to ascend to Huayna Picchu mountain? We have made it possible for thousands of people to reach the top of Huayna Picchu, and our experience teaches us that the best group to ascend to Huayna Picchu is in Group 2, because if you did not know, Machu Picchu is known as the city in The clouds, and it is because a cloud forest covers Machu Picchu at dawn. Pay attention to the trails, we know that the views will be extraordinary, but do not deconcentrate and look well where you put your next step. The roads are narrow, irregular and very steep, it will take between an hour and a half and two and a half hours to go up and down the mountain Huayna Picchu.